At Holywell Primary School; children, parents, staff, and governors are all developing a Growth Mindset attitude to learning. Many schools use superhero characters or cartoon animals to represent these positive traits, but after much research and discussion, staff and pupils in our school council voted to use real-life Animal Learning Powers. If these creatures depend on these traits for survival and success, then we can learn from them! We have learned about each of these four animals in special whole school assemblies this year. You may have heard your children talking about how they've been into "the pit" at school! These posters and others are displayed in all classrooms as visual aids for children and staff to talk about their learning journeys throughout the day. We want the children to understand that it is okay to be stuck and that some of their best learning is done when they find things the hardest. Rather than simply praising success we praise effort and persistence. We believe that the best thing to do is to teach children to love challenges, be intrigued by mistakes, enjoy the effort, and keep on learning. For children who find work easy, we make sure that they encounter more difficult tasks. Our children recognise that effort, persistence and good teaching are what help them improve. It has been proven that having a Growth Mindset can improve children’s progress and attainment. As a result, we are teaching our children that by having a Growth Mindset they can grow their brains and intelligence and are more likely to achieve! This approach links with how we mark work and give feedback too: we always mark giving ‘prompts for improvement’ in writing and ‘next steps / Now Try This’ in maths so that all learning for all children, even the most-able, is seen as a way to grow. If children have fixed mindsets they find it hard to cope with failure: we teach our children to see mistakes and failure as positive. This makes for a very energetic and inclusive culture. It also has a really positive effect on our ethos and on how children approach learning and support each other. Children strive to improve their own personal best, rather than seeing coming top as the goal. "In a fixed mindset, students believe their basic abilities, their intelligence, their talents, are just fixed traits. They have a certain amount and that's that, and then their goal becomes to look smart all the time and never look dumb. In a growth mindset, students understand that their talents and abilities can be developed through effort, good teaching, and persistence. They don't necessarily think everyone's the same or anyone can be Einstein, but they believe everyone can get smarter if they work at it." If you would like more information on Growth Mindset, please speak to your child, your child's class teacher or arrange an appointment with our Growth Mindset champion Mr. Stephenson. 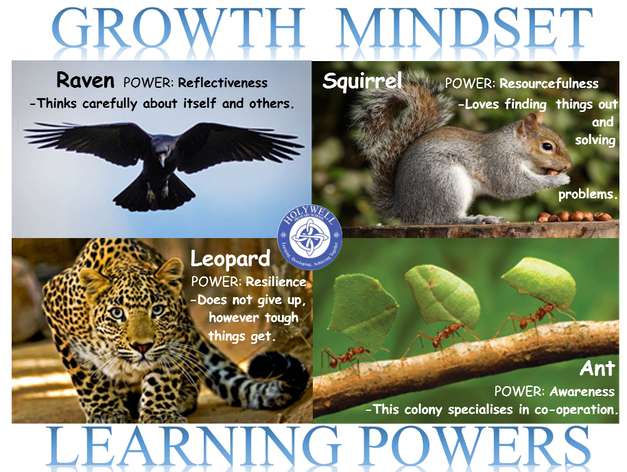 Below is some further information about Growth Mindset and what it means to us at Holywell Primary School, including some examples of motivational quotes displayed around the school. The Girl Who NEVER Made Mistakes! An interview and overview of Fixed and Growth Mindset.